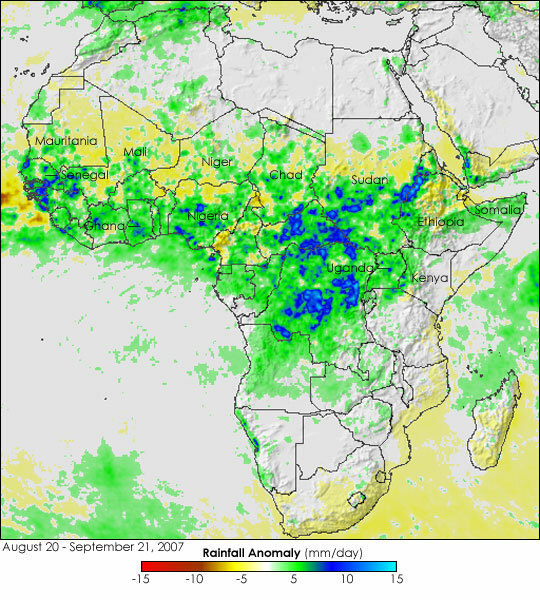 The Sahel region gets most of its rainfall between June and September when the band of near-perpetual thunderstorms that hover around the Equator shifts north. In 2007, the final months of the rainy season brought unusually heavy rainfall to East, Middle, and West Africa, causing floods in river basins from the Atlantic to the Indian Ocean coasts of the continent. This image illustrates how extensive the extreme rainfall was. The image was made with data collected by the Tropical Rainfall Measuring Mission (TRMM) satellite between August 20 and September 21, 2007. The average daily totals recorded during this period are compared with average rainfall totals recorded during the same period since TRMM’s launch in 1997. Regions that received more rain per day than average are blue and green, while places that received less rain would be red, orange, or yellow. The image reveals that most of the Sahel received more rain per day than average in August and September. Some places, marked with pale blue, got as much as 15 millimeters more rain than average per day. The northern Sahel, by contrast, was slightly drier than average, as indicated by its pale yellow tint. The unusually heavy rains caused flooding in as many as 17 countries and affected more than a million people across Africa. … For those areas that escaped flooding, the rains were beneficial, since farmers in the Sahel rely on rain to water their crops, reported the Famine Early Warning System Network on September 19. For more on the flooding see BBC news Sept 19th, and BBC news Sept 21st.